With contributions of: Mauro Barni, Tiziano Bianchi, Rainer Böhme, Luca Caviglione, Gwenaël Doërr, Jessica Fridrich, Teddy Furon, Matthias Kirchner, Huajian Liu, Wojciech Mazurczyk, Alessandro Piva, Boris Škorić, Martin Steinebach, and Andreas Westfeld. Fifteen years ago we published the book Information Hiding Techniques for Steganography and Digital Watermarking, which turned out to be one of first scientific books on the topic. Back then, the field was in its infancy; the scientific community had just started to explore how information could be embedded invisibly or inaudibly in multimedia data. One of the main driving forces at that time was the desire to mark images, videos, or audio files with metadata that identified either the owner or recipient of the document. Steganography also turned out to be a key technology to counter surveillance or censorship. In the early days, many designs were ad-hoc, not based on a solid mathematical theory and repeatedly broken. Furthermore, methods to detect invisible communication, commonly referred to as steganalysis, were in their infancy. 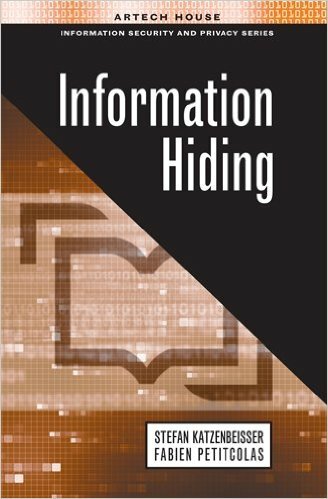 Today, fifteen years later, it is time again to reflect the state-of-the-art in the field of information hiding. Our community now has a solid understanding of the performance and security of information hiding techniques; we have developed a mathematical theory of steganalysis and have explored new promising application domains. The present book aims to capture the state-of-the-art in various domains that are commonly subsumed under the term information hiding. Each chapter is written by renowned experts in the field and aims to give a good introduction to a specific topic. We therefore hope that the book will motivate students to consider studying this field and, of course, professors to consider adding it to their curriculum.